Highly awaited by fans, Attack on Titan is on the verge on entering its third season this year, but in the meantime the team over at Koei Tecmo and Omega Force to give us a sequel to the 2016 game known as Attack on Titan: The Wings of Liberty. Reviewed on our site – which you can click here to read it – the first Attack on Titan game was pretty decent, with just some small technical issues and not enough content. With this second edition, simply titled Attack on Titan 2, the game seems to be more complex, with multiplayer modes, more character and new modes. Is it worth it? Attack on Titan 2 reproduces the same storytelling tale as the first game, stopping this time at the end of the second season of the anime, which I obviously won’t spoil to you. But fans of the show and mange will be delighted to finally follow the events of both the first and second season, with multiple twists and story arc, on the point of view of a neutral character. That’s right, while you control some key Attack of Titan characters in the first game like Eren and Mikasa, the sequel lets you create your very own 104th Division Survey Corps soldier, and thus witnessing the story from an outsider. With this character, you will relive all the key episodes of the Attack on Titan first and second season. The mere idea of ​​reliving entire passages from the previous game was a bit weird, and the risk of repetition was enormous, despite the excuse of a new point of view. Sadly that’s the case, as the first season represents around two-thirds of the story mode, with some key missions from the original game updated to the new game dynamics and visual upgrades. To avoid repeating too much, the title had the ingenious idea of ​​separating us from Eren and his comrades after the Battle of Trost, or towards the beginning of the game’s first chapter, and to make us follow a different path. Spotted by the eccentric Hange who takes you under his wing, your soldier is drafted early in the Survey Corps, where he participates in expeditions outside of the wall, before having officially chosen his assignment. It’s great because with this concept, fans will really apprehend the events of the first season by focusing more on the secondary characters, like how Erwin managed to trap the female Titan, with better narrative skills than the original game. By having your own character, Attack on Titan 2 makes it possible to take advantage of various activities within the city. As you complete missions with other key members of the battalion, you will build a bond, which unlock some nice in-game cutscenes and help you discover a more deep aspect of their personalities. You will also have the opportunity to offer some gifts based on their mood, to gain their trust and friendship, but also through conversations and proper answers picked. These friendship levels will give you access to various skills used in combat, as well as permanent boosted stats, bringing a small dose of RPG which was already present in the first game. In the same way as the original, you will also find the original weapon system, which gives you access to a relatively varied arsenal, that can sometime help you change your approach during battles. For example, some blades will have more reach, while others hit harder, or change your omni-directional gear for more reel speed instead of anchor reach. In addition to your omni-dimensional equipment, you will have access to new tools that can be developed by participating in titan research. Under the orders of Hange, you will need to boost your knowledge of your enemies, by capturing Titans with the help of a brand new feature. During your expeditions, you will meet various types of titans that can be put on the ground without killing them. For this, you will first cut their two legs so they incapacitated for a while, before deploying a giant net to capture them. However, it will be necessary to be cautious since they will not let themselves be caught, but once captured, you will unlock other useful items for your expeditions. In terms of movement and gameplay mechanics, the title follows the great foundation from the original game. Sure the camera can be awkward to manage like it was before, but you’ll easily get your hands on it, and swift through the city and other areas smoothly. There is though a big reproach which is a sense of deja-vu with some of the battlegrounds, considering that the game does indeed reuse the original city maps like the Trost district. Sure adding extra features like the ability to add refuelling bases, manual guns or automatic turrets add a hint of novelty, but it’s not enough to feel like a new game. Combat though is still as fun as it was, where you need to hit the weakness of the Titan with your blade, right under the nape like in the anime. Some Titans are more robust or will protect their neck, so you’ll be able to target the other 4 parts of its body to prevent him from stopping your killing blow. You will also have a scope to spot your enemies from the distance, and perform a stealthy but equally powerful attack, as well as awesome finishing moves that can be done in pair with your squad mates. If the first game was rather easy, Attack on Titan 2 adds more of a challenge, with new Titans behaviors that are more close to the anime. Adding new classes like the Abnormal Titans, Female Titans or more. Their speed and power give rise to epic fights, especially since the buggers do not hesitate to rally other titans around, which makes the battle completely chaotic but fun. Your team will also be able to join in the fight, with up to 4 supporting characters per missions, each with their own skills and cooldown effect. These range from Captain Levi’s devastating instant kill attack or even Eren who can turn into a titan. Finally Attack on Titan 2 overall proposes a richer content outside of the story mode, with a bunch of online and coop modes to add more lifespan to the game. In those modes, you’ll be able to play as one of the 30 known characters of the franchise. An online competitive mode is also available known as Annihilation, which unfortunately I couldn’t try out even as servers are online today due to unpopulated lobbies. In any case, the mode has teams of 4 compete for the highest score in killing Titans effectively and with multiple elements depending on the chained kills or duo kills. When it comes through to the technical aspect of the game, then I’m glad to say that it works really well on Nintendo Switch. Now since the environments of the first game were reused in their entirety, they still got a pleasant facelift. The maps are more dynamic thanks to destruction as well as enhanced textures and great work on lighting. The only criticism that could be made is the lack of diversity, which is unfortunately was a particular flaw in the original game, but at least it’s technically solid with rare framerate drop on the Nintendo console in both docked and handheld mode. The original Attack on Titan was a pleasant surprise for gamers used to Japanese titles that didn’t play nice with PC, and Attack on Titan 2 is no different. The game is very well-scaled, and you can manage it without too much bother on a GTX 600 series. So we gave it a shot on our reviewing PC desktop and it had no real problems. Visuals are clean and smooth, and there’s much better lighting this time around. Anti-aliasing is also considerably better, and images seem much more defined. The game still opts for a more anime look and feel so it won’t appear as shiny and fancy as more graphically intensive games, but it has a nice aesthetic nonetheless. In terms of frame rates we had no issues maintaining a steady 60fps at 1080p, even when we kicked it up a notch to 1440p. Again, good hardware helps, but a badly optimized title will tank whatever hardware you bring to the party, and Attack on Titan 2 definitely doesn’t suffer from this. But when it comes to control schemes, take our advice and stick to the ol’ controller. The game has nice controller support, and it just doesn’t work as well with keyboard and mouse. 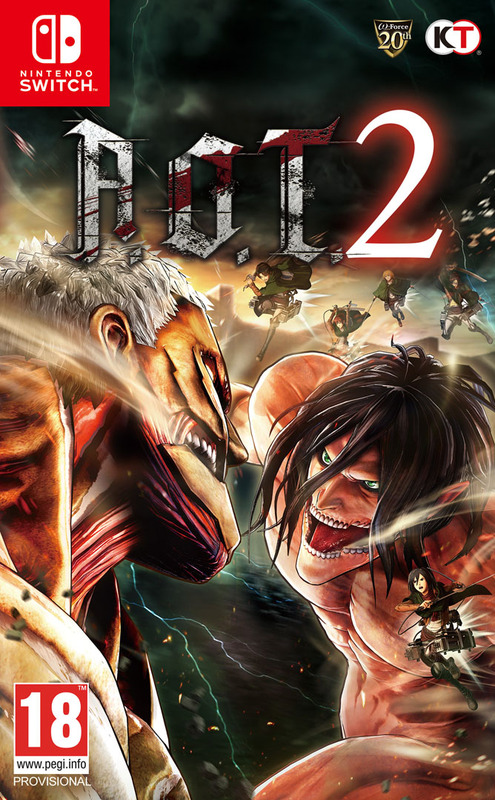 Attack on Titan 2 was reviewed using a PC and Nintendo Switch digital download code of the game provided by Tecmo Koei. The PC review was tested on a machine running Windows 10, with an 8GB NVIDIA Geforce GTX 1070 fitted on a 4th Generation Intel i7 4790 3.6Ghz CPU and topped with 16GB of RAM. The game is also available on Xbox One and PlayStation 4 in digital and retail stores. We don’t discuss review scores with publishers or developers prior to the review being published (click here for more information about our review policy). With Attack on Titan 2, Koei Tecmo and Omega Force manage to upgrade the game experience from the original, adding more content and modes to make it worth your while. No fan of the franchise, anime or manga should miss this title.